At UK Time Solutions, we supply a full range of electronic time and date stamp and job timer machines to suit every budget and application, all with the aim to improve the efficiency, accuracy and profitability of your business. The date time stamp is suited to various applications, whether it be in garages, workshops, offices, schools, hospitals, police station or airports or for any time and date stamping requirement. The flexibility of the time and date stamp is ideal, it can be tailored to suit your individual requirements when it comes to timing, costing and recording or simply time and date stamping of time-sensitive documents. Regardless of what type of business you have, we have the perfect time and dating solution waiting for you at UK Time Solutions. The electronic time and date stamp would be a good addition to your business, improving efficiency, accuracy and security of documents etc. If you need to know more about our time and date stamp then don’t hesitate to get in touch with the team at UK Time Solutions - we will be more than willing to help you to find something suitable from our extensive range of products. 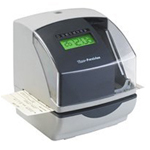 The NT-20A is a robust electronic Time & Date Stamp / Job Timer and is ideal for keeping track of the time spent on a job or time and date stamping of important documents. 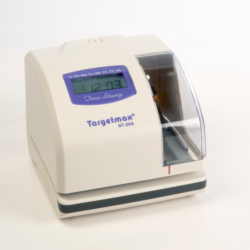 The NT-20A electronic time stamp and numerator machine accurately records time, date, and numeration. The print format is user definable with over 30 combinations available. The Needtek TS-350 heavy duty time and date stamp is the ideal choice for businesses that require a time, date and/or number stamping on documents, recommended for garages and businesses that require a heavy duty time stamp. 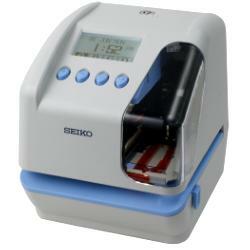 The New Seiko TP-50 Time & Date Stamp - Automatic Time & Date, Numbering and Messaging printer from Seiko. 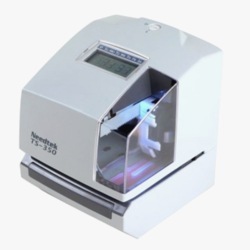 Unique two line printing with Seiko quality, reliability and versatility, Ideal for all sizes and types of organisation where records are kept and document control is required. The Time Precision TP-300 is one of the most advanced time, date and numbering printer has arrived on the market. The TP-300 has a huge range of functions that offer more convenient and versatile features than its predecessor.